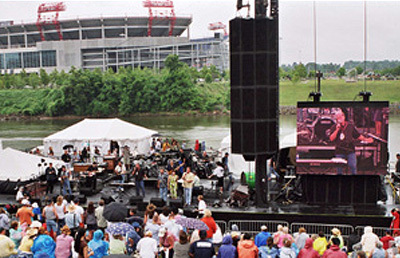 In spite of the weather, the show goes on at the Greased Lightning Stages at Riverfront Park. Fans and bands donned rain suits and enjoyed themselves anyway! 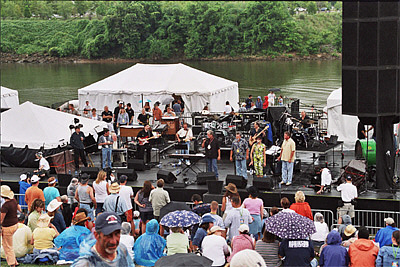 The stages were actually floating barges, and fans lined the riverbanks to see the show. 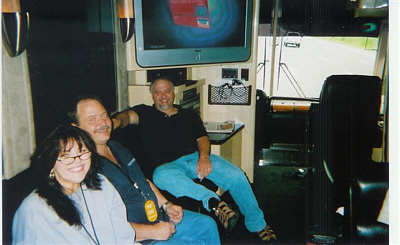 A few of Con's band members relaxing on the bus before the show. 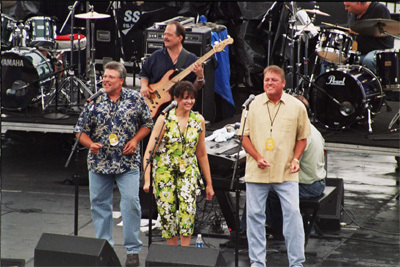 From left, Con's sister and backing vocalist Ruth Akers, bassist Burton Akers and drummer Tony Creasman. 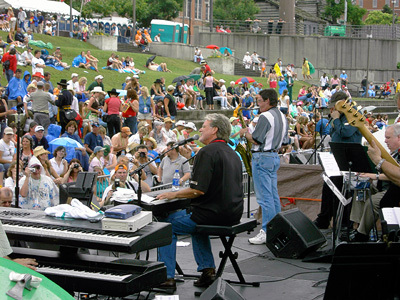 Taking the stage at Riverfront Park, the timeless band is Kirk "Jelly Roll" Johnson on harmonica, Ken Jackson on saxophone, Herby Wallace on steel guitar, Greg English on guitar, Randy Layne on guitar, Con Hunley vocal and keyboard, Burton Akers on bass, Stan Williamson on keyboards, and Tony Creasman on drums. 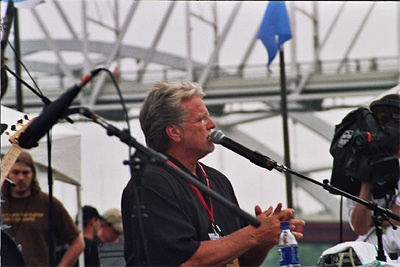 Backing vocalists are Tim Hunley, Kenny Hunley, and Ruth Akers. 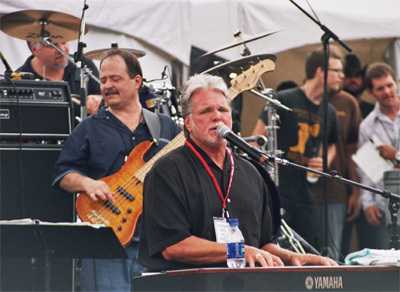 Con on piano with bass player Burton Akers, drummer Tony Creasman (upper left). Who is that good looking guy on the big screen? 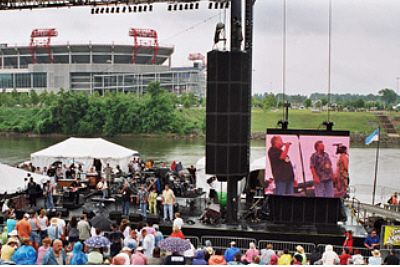 Backing singers Tim Hunley, Ruth Akers, Kenny Hunley and bass player Burton Akers on the Riverfront Stage. 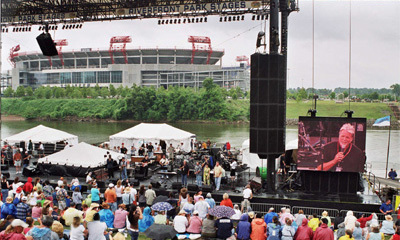 Con performs at the Riverfront Stages. Ken Jackson is just to his right on saxophone and you can barely see Herby Wallace on steel. 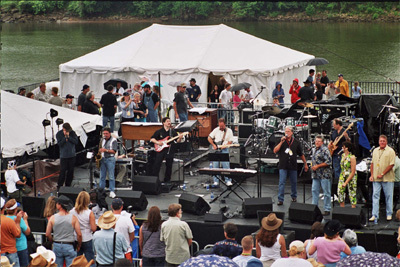 The band opened up with the swinging "Never Had It Laid On Me" and performed three singles from Sweet Memories: "Still," "Only Time Will Tell" and ""She Ain't You." Con tells the crowd he's happy to be there and is glad they're hanging with him, even if they are getting a little wet! There was an on-and-off light rain all afternoon, but the fans covered up and and enjoyed themselves anyway. 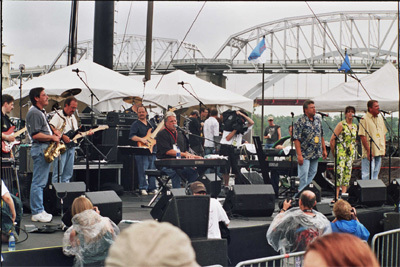 L-R Greg English on guitar, Ken Jackson on sax, Randy Layne on guitar, Burton Akers on bass, Con Hunley on piano, Tim Hunley, Ruth Akers and Kenny Hunley, backing vocalists. 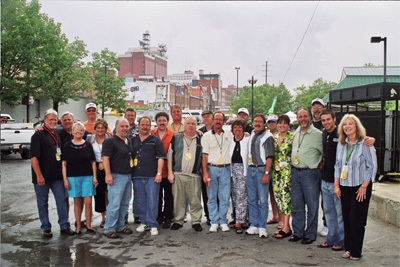 A slightly damp IMMI Team wraps up a great day at the CMA Music Festival!